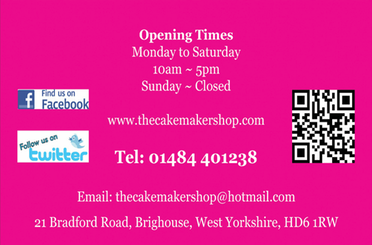 We are in easy reach of Brighouse, Dewsbury, Batley, Wakefield, Ossett, Huddersfield, Keighley, Skipton, Bradford, Shipley, Leeds, Halifax, Wetherby, Harrogate, York, Barnsley and Sheffield close to the the M62, M1 Motorway networks. Transporting a cake especially a tiered wedding cake can be a nerve racking experience. Never put a cake on the car seat as it will slide off its boards even though it appears to be flat. Always put the cake on a flat surface preferably in the boot of your car.